CLOTH WIRE 22G - 22 Guage Green - 6"- Approx.100-110 pcs. CLOTH WIRE 22W - 22 Guage White - 6"- Approx.100-110 pcs. 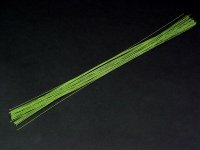 CLOTH WIRE 24G - 24 Guage Green - 6"- Approx.150 pcs. CLOTH WIRE 24W - 24 Guage White - 6"- Approx.110 pcs. W20W - Wire 20 gauge - White - 50 pcs. W22G - Wire 22 gauge - Green - 50 pcs. 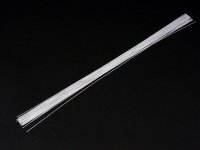 W22W - Wire 22 gauge - White - 50 pcs. W24G - Wire 24 gauge - Green - 50 pcs. W24W - Wire 24 gauge - White - 50 pcs. W26G - Wire 26 gauge - Green - 50 pcs. W26W - Wire 26 gauge - White - 50 pcs. W28G - Wire 28 gauge - Green - 50 pcs. W28W - Wire 28 gauge - White - 50 pcs. W30G - Wire 30 gauge - Green - 50 pcs. W30W - Wire 30 gauge - White - 50 pcs.